The elevator's really impressive - agree you've got the concrete a convincing shade. I could use some of these for sure. I haven't seen anything like them before. Outstanding work on the elevator! I can't to wait to see more of your layout, Webbo! 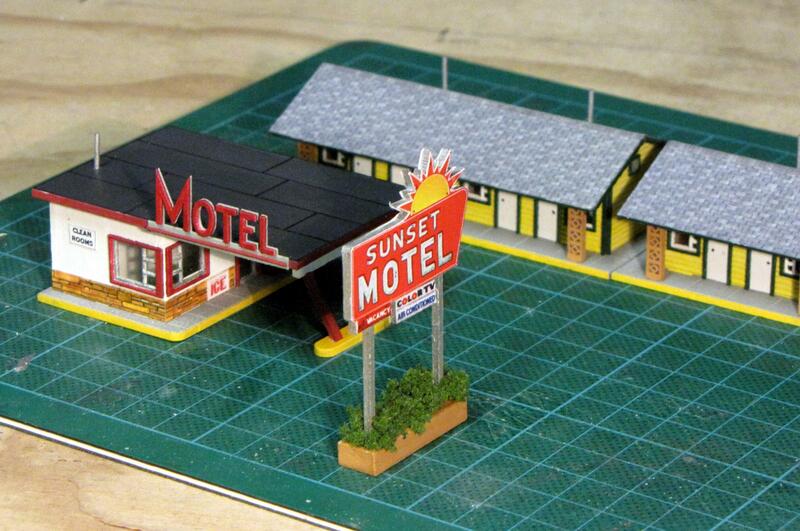 I've just completed my next kit which is the Sunset Motel, a laser cut kit by Blair Line. This is my third laser kit and I'm finding that I quite like them even though I suspect they would take longer to assemble than an equivalent plastic kit mainly because all the parts have to be primed and painted and the paint sinks in. Almost all the parts for this kit fitted together very well except for a couple that had to be fiddled with a bit. 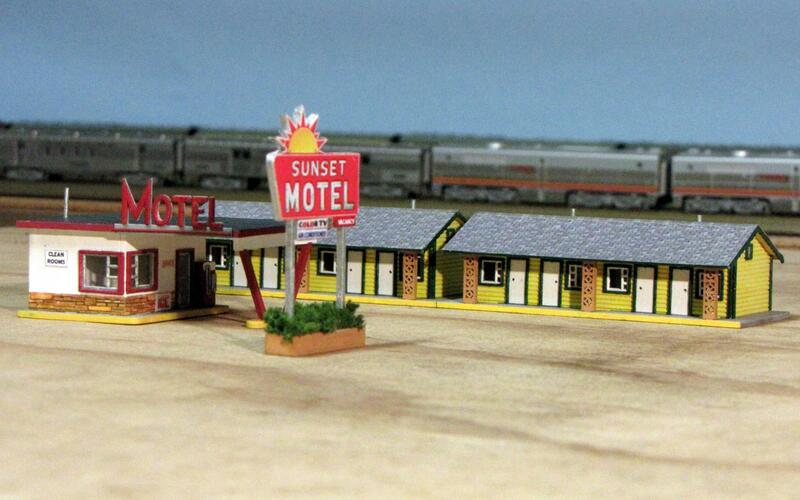 The Sunset Motel located near Deadwood railway station caters mainly to itinerant workers and commercial travellers, but during the summer months especially, vacationers add to its clientele considerably. Deadwood itself is not a tourist hotspot, but the surrounding countryside attracts visitors for its water sports including fishing and boating as well as hikers. The proprietors of the Sunset Motel, Bob and Marj Westerlund, being of Scandinavian heritage, take pride in running a tidy and clean operation. This is fortunate for Webbo, the modeller, as he does not need to do much weathering as the building exteriors are kept in excellent condition. I agree. It looks really good. I hope my laser cut card models turn out half as well. 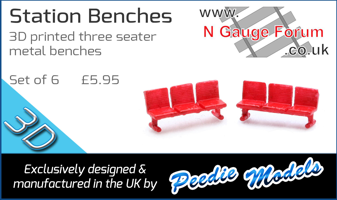 They look great Webbo, certainly brings a lot of colour to the layout,love them. Thank you for your compliments folks. I'll pass them on to Bob and Marj. Yes, the paint scheme make things look a little less dreary thereabouts during the long winter months. They do make a change from the same colours we usually get over here, the colours just look so right. Because this past week has been totally taken up with Bealette's wedding and entertaining my NZ guests, I've just seen this. How long did you take to complete this one? Also I enjoyed the story come with the motel!! Please tell Bob and Marj to send me a discount coupon for the motel. I wouldn't call the Sunset Motel museum quality, but thanks for the compliment just the same. It's mainly down to the kit as I just painted it and put it together. I didn't keep track of the time spent assembling it, but I'm guessing at least 10 hours. Certainly, quite a lot more than a couple of evening's work. Being a small family operation, Bob and Marj don't have discount coupons. However, if you give them a call and mention my name, they'll give you 10% off. Bob or Marj will probably answer the phone, but their daughter, Jenny, sometimes fills in. And well done George on your daughter's wedding. After all, our biological function is to rear our kids to functioning adults (hopefully), and then we can disappear off the planet or go away and enjoy our model railways.